Fools Crow repeatedly said the more humble and unselfish a person is, the more willing Wakan Tanka and his helpers of the four directions are willing to work through them. 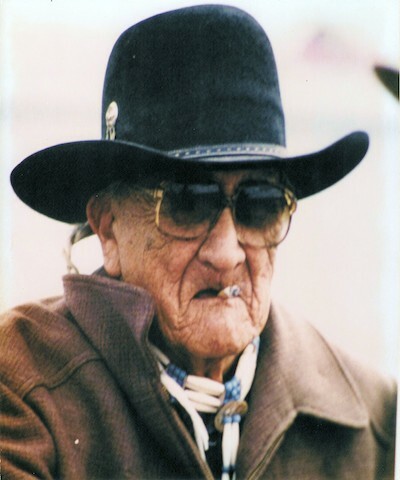 Few holy people have been as open about their spiritual practices as Frank Fools Crow, the ceremonial chief of the Teton Sioux who allowed his powers to be written about in books by non-Native authors. Assuming no ownership of his supernatural abilities—always affirming the “source of power is not ourselves” —Fools Crow explained in detail how he performed “miracles” because he wanted others to believe they could do them as well. Before he died at the age of 99 on Nov. 27, 1989, Fools Crow spent time in the late 1970s with Thomas E. Mails, a Lutheran minister who wrote about him in several books, including the well-received Fools Crow–Wisdom and Power. In it, the old man explained how he affected cures, consulted with “talking” stones to learn of future events, “lured” to him what he needed in his life, spirit-travelled, and shape-shifted. He accomplished all of this by becoming a “clean, hollow bone” through which Wakan Tanka’s (The Great Mystery’s) powers funneled through him. Fools Crow repeatedly told Mails that the more humble and unselfish a person is, the more willing Wakan Tanka and his helpers of the four directions are willing to work through them. “Wakan Tanka is concerned with human needs, and not luxuries. If we want luxuries, He has given us at birth the power to work for and obtain these,” he said. People who have rid themselves of self-serving ego, like medicine and holy people, are the cleanest bones, he explained. As a Sioux person, he was taught to understand there was no limit to what the higher powers could do through him. Fools Crow described his life as being “filled with power” and he thought about Wakan Tanka constantly. To remain a clean, hollow bone, he refrained from arguing, gossiping and womanizing. He didn’t charge for his healing, although he accepted gifts and gratitude from people he helped. He abstained from mind-altering substances, even the peyote used in the Native American church, because Wakan Tanka could take him higher than any drug ever could. In his lifetime, he struggled to find someone to pass his medicine to because so few wanted to live morally and frugally. “While many talk a lot about wanting to do this, they do not really want to give up pleasure and material things. Also, you can tell a true medicine person from an imitator by what they ask you for in return for their help. As a child born near Wounded Knee in South Dakota around 1890, Fools Crow was forced to quit school in the third grade so he could work and support his family. He travelled around the United States later with the Buffalo Bill Cody Wild West Show before becoming a healer after his initial vision quest in 1903. He married Fannie Afraid, who passed away in 1954, and his second wife, Kate, died in 1988. Both wives assisted Fools Crow in his curing rites and watched over him while he spirit-travelled inside his sweatlodge. “Actually, this spirit travel I do has frightened both of my wives,” he once confessed to Mails, explaining he would sometimes remain unconscious inside the lodge for as long as two days. Fools Crow used his “mind screen” – the blackness he saw when he closed his eyes and rolled his eyes upward – to receive information from Wakan Tanka. If he saw that a patient’s organs were damaged beyond repair, he revealed to he or she that they could not be cured, but could still be healed. “Healing is a process that helps the person get rid of anger and blaming” and reconcile unfinished business in their lives, Fools Crow said. “When we are finished with the healing, the person is calm and ready, even anxious to die. ‘Die’ is not really the best word, because it suggests that it is the end, when it is really the beginning. Fools Crow lived long enough to mediate between the U.S. government and AIM activists at Wounded Knee in 1973. At the Elder’s funeral, eulogist and AIM leader Russell Means credited Fools Crow with the peaceful ending of the famous confrontation. Fools Crow was well-loved for keeping alive Lakota ceremonies that had been outlawed by the government, and is famous for pleading before a congressional subcommittee that the Black Hills be returned to his people.